Vampire Teeth Lollies with a bite. Great for Halloween or just scaring your parents! And they don’t taste bad either. Each 190g bag has roughly 35 teeth. 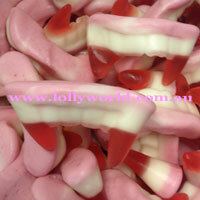 Vampire Teeth Lollies are great for Halloween or just scaring your parents! And they don’t taste bad either. Each 190g bag has roughly 35 teeth.